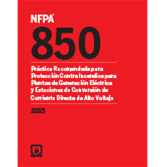 Reduce fire and explosion risks with the 2015 Spanish edition of NFPA 850 for fire protection in electric generating plants. NFPA 850, Recommended Practice for Fire Protection for Electric Generating Plants and High Voltage Direct Current Converter Stations outlines fire safety recommendations for gas, oil, coal, and alternative fuel electric generating plants including high voltage direct current converter stations and combustion turbine units used for electric generation. Provisions apply to both new and existing facilities. Gain confidence that your fire protection plan addresses all relevant hazards. NFPA 850's recommendations address the safety of construction and operating personnel, physical integrity of plant components, and the continuity of plant operations. NFPA 850 requires the development of a Fire Protection Design Basis Document that identifies relevant hazards -- such as the presence of fuels, lubricating oils, flammable liquids, electrical equipment, and dust explosions -- along with how installations will be protected. The complete 2010 edition of NFPA 851, Hydroelectric Generating Plants has been incorporated into NFPA 850 in a stand-alone chapter. Added coverage of active carbon injection systems reflects increasing use in the field. The powdered active carbon used in these types of systems could present an explosion hazard. The 2015 Spanish NFPA 850 increases awareness of the risks and offers mitigation strategies. Interested in the 2010 NFPA 850 in Spanish? Use the drop down menu above to select the edition year.